Glad to have found this place. Never even knew such a chatroom existed till I was in need of it. If you need a Christian forum this is the right place for you. Welcome! God bless! Thank you Marcelo! God bless you too! Perhaps God has steered you to this place for a reason. We all were new once so just relax and be yourself. Glad to have you as part of our community. Welcome to CC. Thank you Tourist! Indeed so, I know in part but He knows the whole. Hello Soulstar, welcome to cc. I hope you'll enjoy your stay here. Thank you JoeFizz! Yes i love to learn the Word. I will look out for that ! Thanks Sweetmorningdew78! That's sweet of you ! Thank you Deade - i trust i will ! Just a question - where can i find support for domestic abuse? I came here to be able to talk about it and just sort things out logically within myself. I can't find the chatroom for abuse support. Thanks in advance ! Hello Soulstar, I have not seen a thread that specifically relates to domestic abuse. I would advise that you visit a rather general thread that is used by many members. Then start asking questions. You should receive numerous responses to your questions. Suggestion: go to the top left hand corner of the page and select "Christian Chat Rooms and Forums". Then select "Christian Singles Forum" and then the thread "Streams of Consciousness and Thoughts". This is a general subject thread where you may find some answers. This is a beginning. 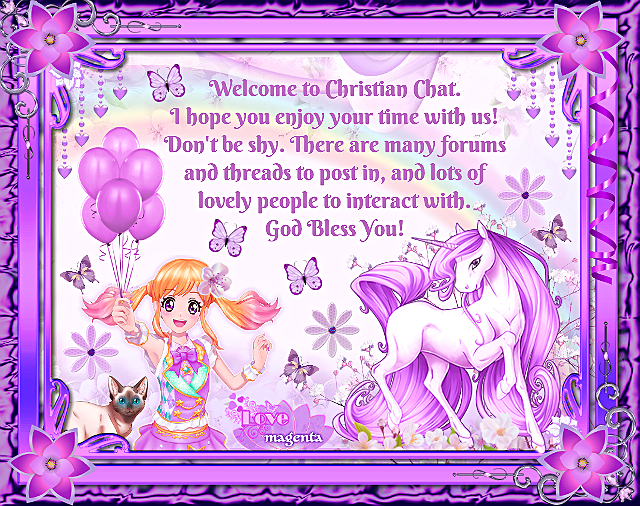 I hope you find many friends, good fellowhip and the support that you need.....and Welcome to Christian Chat! Welcome aboard Soulstar. hope you enjoy this site..
Hello, welcome to CC... this is a great place to meet and network with other Christ like minded people. Welcome to you as well!